In this unbelievably pure, honest, poignant story, a military man writes vividly about his life, travels, and experiences in and out of Vietnam. George actually joined the army for an education, and got far more than he ever bargained for. Our story begins while he is assigned to protect a package. Flown into Vietnam, guarding the arrival of said package, George is soon walking through Saigon to reach the jungle base camp. As he walked through the streets, every little detail of the location and the people - the horror, as well as the starvation and “deals” being made in the streets are spotlighted, making the reader feel as if they’re right there beside him the whole way. Soon George is working nights in the ‘vault’ at an old plantation that the American military are using for their wartime purposes. During the day, George spent some time teaching English to the bar girls and in return he was taught the Vietnamese language. While there, he meets a woman by the name of “Candy” who has far more secrets than he can possibly imagine. Having a whirlwind romance with the young woman, George finds himself back at home and working for a secret government agency. Being upgraded, George enters into a rescue operation. 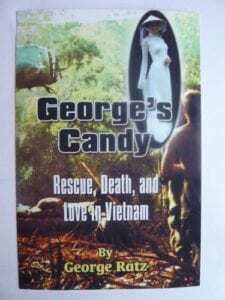 He is told that a woman in Vietnam has asked for George and only George to come over and save her. She goes by “Candy” and she’s a spy. There were many double-agents throughout wartime and “Candy” is a high priority operative that needs to be extracted as soon as possible. George is promoted, per say, and is given the power to not only be a field agent, but to make all decisions necessary for the extraction to work out well. Even the Navy Seals, the Special Forces, the FBI, and a beautiful agent who is shadowing George makes him feel as if he is completely inferior and should have no authority to do what’s about to be done. Soon, the author has us traveling through the iron triangle of tunnels that sit beneath the Vietnamese land. Readers are locked in debriefings with Generals who don’t exactly seem to be on the right side. Travel to the United States by air, land, and sea come about, and George and Candy must find faith in others to survive. Written in language that speaks of complete military precision, the author immediately gets his “hooks” into the reader and tells a story that is so amazingly fast in pace and unpredictable, that it seems more like a big-screen thriller than a real-life harrowing adventure. Quill Says: Whether you have a background in military service or not, this is a truly fantastic read that doesn’t let you take a breath until the very last page.